In the center of platis Gialos is the restaurant "Cyclades". 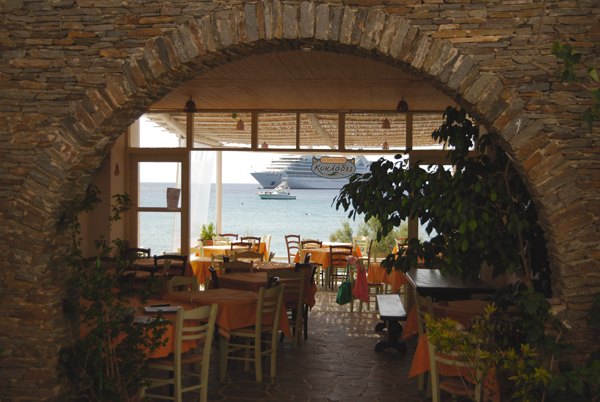 The restaurant was founded in 1979 by rural family of Sifnos, in order to have the agricultural and livestock products. From then, until today, works every year from March to November, offering delicious dishes and beneficial for the body, as required by the definition of culinary art. The cuisine of our restaurant always directs graduate Cooker, who has great experience. In the restaurant we serve traditional "sifneiki" cuisine and General Greek cuisine with vegetables and meat from our own production. Some of our traditional dishes are: chickpeas in a wood oven, chickpea balls, mastelo and capersalad. However you should not forget to try the mousaka, stuffed with rice, the Imam and the hull pork. In our catalog are listed all the meals and snacks on offer. In the Salad Bar of our restaurant you can make the salad of your choice.